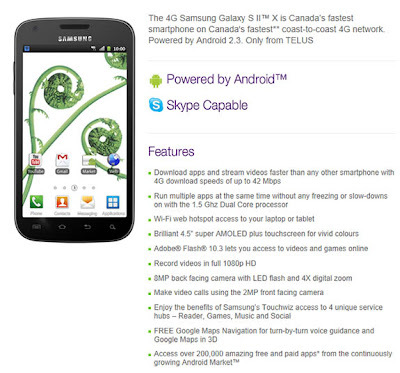 And now, the Samsung Galaxy S II X ( SGH-T989 aka Hercules ) has officially been confirmed in the Canadian operator Telus. Reminder: this version features a large touch screen of 4.5 inch AMOLED technology Super Plus with a resolution of 480 by 800 pixels (WVGA). The resolution is somewhat low compared to other high-end smartphones provided in the mobile market. I still do not know the brand of the embedded architecture, though I know she has two hearts and will be clocked at 1.5 GHz. As for cameras, there is a 2-megapixel front and back of 8 megapixel camera with flash and the ability to record video in 1080p at 30 frames per second. The network part, the Galaxy II S X supports Wi-Fi, Bluetooth, GPS / A-GPS, and 4G (up 42M/bits in reception).